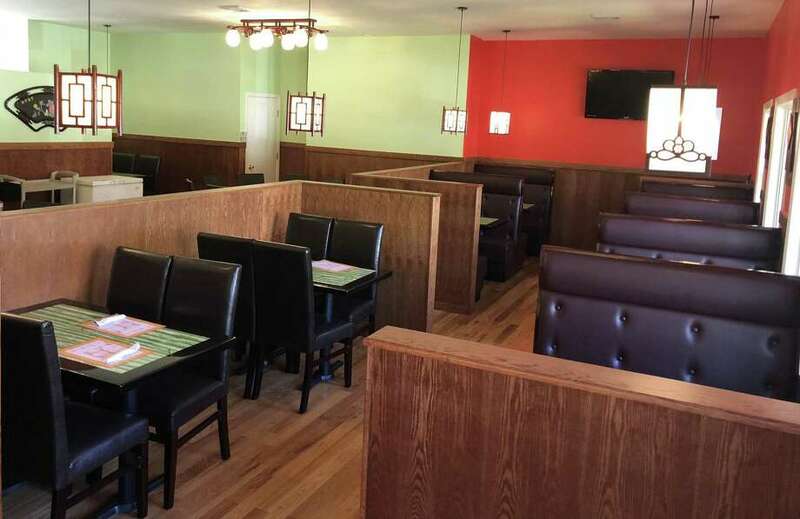 Shang Hai Asian Fusion restaurant in Kent recently underwent a major renovation and expansion. Shang Hai Asian Fusion in Kent is celebrating a complete renovation, including an expansion of its dining space, and a revitalized menu. The longtime restaurant on Kent Green, which marks its 35th anniversary this year, recently expanded, more than doubling the space it has operated in the past few years. It is now a full-service restaurant featuring booth and counter seating. It also continues to provide takeout service. “We’ve always wanted to make the restaurant bigger,” said Qiaohua “Christine” Zhang, who owns the restaurant with her husband, Tian You “Aaron” Zhang. In addition, the restaurant will soon offer wine, beer and sake, as well as bubble tea. A new HVAC system was also installed. The dining area that has served as the main part of the restaurant for years now boasts updated booths and tables, a counter and a new sushi bar. Bright Asian-themed pictures grace the wall over the counter, and other decorations convey Asian culture. The new main dining area features numerous booths that comfortably seat four, but could seat more. Asian décor hangs on the walls, as does a TV, and Asian-inspired lamps hang from the ceiling over each table. On the other side of a half-divider in the main dining area are two large round tables that seat 10 for family-style buffet dining. Zhang said the space is suitable for catered, private events. Luca, who has been a customer for eight years, praised the food and the restaurant’s atmosphere. “And I love how they cook their vegetables,” she said, citing the restaurant’s healthy focus on dishes. The Zhangs operated restaurants in Tennessee and Kentucky before moving to Kent in 2010. They soon purchased Shang Hai Chinese Food from the restaurant’s owners and, in 2013, moved the business to its current location at 1 Landmark Lane, off Kent Green Boulevard. The recent changes and addition of a sushi bar was prompted by the Zhang’s desire to expand, as well as customer feedback. “A lot of customers said they wanted more (offerings) and sushi,” Zhang said. Resident Carrie Dubray is a faithful customer. “The food is great, the atmosphere is wonderful and it’s a very friendly staff, very welcoming,” she said. The menu features numerous appetizers, soups, fried rice, Lo Mein, Chow Mei Fun, Chow Fun and Pad Thai, Moo Shu, Chow Mein, sweet and sour options, Egg Foo Young, chicken, beef, pork, seafood, vegetables and more. A special diet menu includes a variety of options, each served with steamed white rice or brown rice and a choice of four sauces: white, brown, garlic and Szechuan. Expanded fried rice offerings are also available at the restaurant. Among them, ham and egg, shrimp, Yang Chow and Shanghai fried rices. Zhang said the business’ specials — such as twice cooked pork, beef with Bok Choy, salt and pepper chicken and coconut shrimp — are popular items. She said all of the sauces are homemade, and all of the food is made fresh daily. Barbara Kilmer of Cornwall Bridge said she dines at the restaurant several times a month. “The food is good and the price is right,” said Kilmer, who said she tries a variety of dishes. The customer also praised the owners and staff. Zhang emphasized that one of the unique features of the restaurant is its delivery service. The restaurant delivers to the multiple private schools in town. The Zhangs are active in the community, being involved with both the public and private schools in town. The restaurant, located at 1 Landmark Lane on Kent Green, is open Sundays from noon to 9:30 p.m., Mondays through Thursdays from 11 a.m. to 9:30 p.m. and Fridays and Saturdays from 11 am. to 10 p.m. For more information, call 860-927-4809 or visit www.shanghaifusion.com.